Some millionaires decorate their mansions with rare paintings. Richard Moriarty bolted a 1974 Lamborghini to the wall of his Newport Beach estate in California early on Friday - reports Roy Rivenburg in the LA Times. Because Home Depot doesn't sell kits to hang cars as artwork, Moriarty hired a 70-ton crane to lower the Italian sports car through a skylight in his living room. Earlier, the car's engine was removed and transformed into a "200-mph coffee table" for guests who prefer their drinks "shaken not stirred," said Moriarty, an heir to the family that developed South Coast Plaza. Getting the Lamborghini into the house took about an hour, but the project was conceived months ago, when architect Fleetwood Joiner began designing Moriarty's new home, US$2-million worth of steel-and-concrete that will overlook Newport's Back Bay when construction finishes later this year. "This was one of the original ideas for the house," Joiner said. 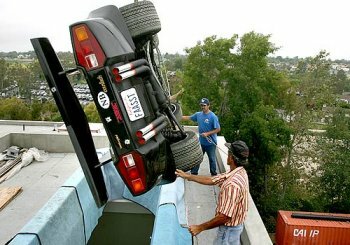 "The skylight was designed to fit the car." Joiner has installed offbeat elements in previous mansion projects — including indoor rifle ranges, bowling alleys and a 28-foot-high interior waterfall — but the Lamborghini is "one of a kind," he said. The car will hang over a solid glass staircase leading to Moriarty's wine cellar. 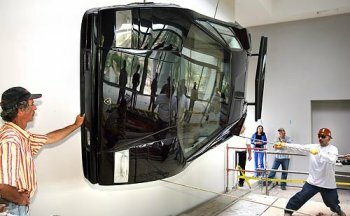 The car will also plug into the home's electrical system so its inside lights can be switched on. Has gasoline gotten so expensive that it's cheaper to turn a Lamborghini into a wall sconce than to drive it? Not quite. Moriarty, 58, is known for his irreverent tastes. In the 1980s, he organized exotic costume parties, such as his "Pimps, Hookers, Drug Dealers and Lawyers Ball," that drew about 3,000 revellers. As onlookers snapped photos with cellphones and cameras, the car was hoisted 60 feet in the air by the crane. Then a five-man crew manoeuvred the 1,000-pound, engineless vehicle through the skylight and hung it from a steel-reinforced wall with loops of half-inch-thick steel cable. Photos: Rick Loomis/LAT. Some millionaires decorate their mansions with rare paintings. Richard Moriarty however bolted a 1974 Lamborghini to the wall of his Newport Beach estate early Friday. Photos: Rick Loomis/LAT. As a teen, he toiled in the lima bean fields that his uncle, Henry Segerstrom, transformed into South Coast Plaza. More recently, he planted a small vineyard on his 3.5-acre estate and began bottling prize-winning wines under such labels as "Wretched Excess" and "The Idle Rich." The fermented grapes are aged in a 75-foot-long cave locked with a former KGB prison key. Outside the cave, catfish and koi swim in a lagoon fed by a 200-foot stream built by Moriarty, who owns an orchid nursery and landscaping business. A pirate flag flaps nearby and chickens strut around a coop. The automotive addition to Moriarty's cache of curiosities seemed only logical. "I have a Lamborghini and I've got a big wall," he said. Moriarty bought the car 10 years ago, paying a collector US$60,000. But the upkeep was a nightmare. The gas tank had rust damage, and the engine kept stalling. "I got tired of having it towed," he said. 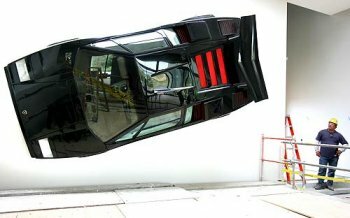 On Friday, the sleek black Countach — license plate "FAASST" — was officially retired. 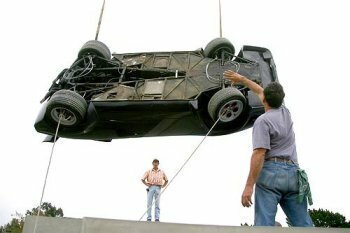 As Moriarty's fiancée, auto mechanic, architect and several friends snapped photos with cellphones and cameras, the car was hoisted 60 feet in the air by the crane. Then a five-man crew manoeuvred the 1,000-pound, engineless vehicle through the skylight and hung it from a steel-reinforced wall with loops of half-inch-thick steel cable. "It's a beautiful piece of art," Joiner said. But Moriarty, in flip-flops, shorts and a T-shirt, wasn't quite satisfied. "I want to stencil some tire marks on the wall," he said. "Seriously."